Anyone who grows zucchini can attest to the phenomenal growth they can find in their zucchini patch if they’ve gone away for a weekend. You’ll come back to massive zucchinis the size of a balloon. Once, when we were holidaying in Portugal, we stayed at a gorgeous self contained villa. The owners veggie patch was brimming with tomatoes, chillis and zucchinis. They also had giant zucchini. We had free range, so I made this recipe. We had enough to feed 6. Yum. Start this before you start the stuffed zucchini and it will cook, reduce and soften while the zucchini cooks in the oven. Dice the ingredients fairly small. Toss them into a smallish saucepan. Cook all the ingredients together over a low heat, stirring often to prevent sticking. The wateriness will reduce down as you are making the zucchini and baking it. When the zucchini is ready to serve, mash the sauce ingredients well or blend for a smoother sauce and serve drizzled over the zucchini. Slice off a thin slice for the lid and set aside. Hollow out the middle of the zucchini leaving about a 1.5cm shell all around. Keep the middle part for some zucchini leek and sweet potato soup. To the bowl of prepared cous cous, add the garlic, herbs, and dip. Mix well. Simply pile this into the zucchini shell. 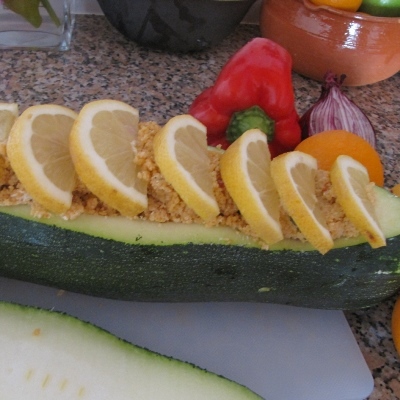 Arrange the lemon slices on top and put your zucchini lid on top of that. Sit the zucchini on an oven tray and bake the lot at 200C for about 45 minutes. 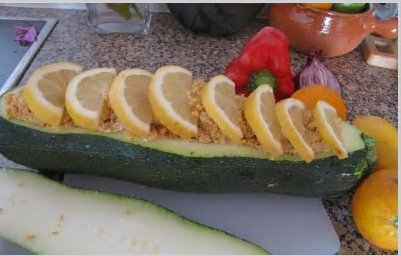 Remove the lid and place it on the baking tray next to the stuffed zucchini and pop the whole lot back into the oven for 5-10 minutes so the lemon can caramelise on top. When the zucchini shell is softened, remove the whole lot from the oven and slice into thick slices. Serve with the tomato sauce that has been simmering this whole time. We ate this with a green salad and loved our home grown Portuguese travellers meal. Mary and Les enjoyed it too.